Horse people really like the Corgi. They are excellent herding dogs as well as outstanding indoor pets! The dogs and the horses work well together and often become companions, as well. The Welsh Corgi is a small type of herding dog that originated in Wales. 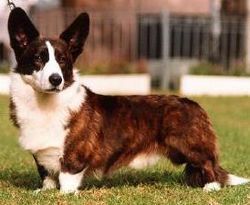 Two distinct breeds are recognized: the Pembroke Welsh Corgi and the Cardigan Welsh Corgi, with the Pembroke being the more common. Corgis are healthy dogs, living into their early or middle teens; however, both do suffer from a few hereditary diseases. 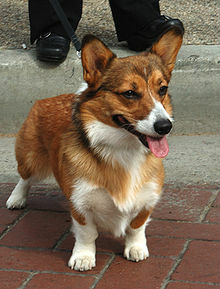 The most famous Welsh Corgis are perhaps those of Elizabeth II of the United Kingdom, who keeps at least four Corgis. The derivation of "Corgi" is not exactly known, though there are two popular theories about the word's origin. The primary theory is that "Corgi" is from Welsh cor gi - cor, "dwarf" and ci, "dog." Other sources, however, attribute the origin of "Corgi" to a variation of cur ("watch dog") and ci ("dog"). The history of the Corgi, like that of most dog breeds, is difficult to trace and authenticate. There is mention in an 11th century manuscript of a Welsh cattle dog, though there is no evidence about whether this is the Corgi or an ancestor. Corgis are herding dogs and perform their duties by nipping at the heels; the dog's low stature allows it to avoid being kicked in the process. As herding dogs, Corgis work livestock differently than other breeds. Instead of gathering the cattle the way a Collie would, by running around the livestock, Corgis drive the herd forward by nipping at their heels and working them from behind in semicircles. Seldom giving ground, if an animal should turn and charge, the Corgi will bite its nose, causing it to turn and rejoin the herd. Although they specialized in herding cattle, Corgis were almost certainly also used to herd sheep and Welsh ponies. Not just used for herding, though, Corgis also guarded children and were beloved pets. Loyal, alert, fun-loving, even-tempered and confident, Corgis have all the qualities of a good family dog. Welsh folklore says the Corgi is the preferred mount of fairy warriors. There is also a folk legend that says Corgis were a gift from the woodland fairies, and that the breed's markings were left on its coat by fairy harnesses and saddles. There are two breeds of Welsh Corgis, the Cardigan and the Pembroke, each named for the counties in Wales where they originated. The only difference to those unfamiliar with the breed often appears to be that the Cardigan Welsh Corgi has a tail, while the Pembroke does not. However, closer examination of the two breeds reveals differences in bone structure, body length, and overall size that indicate separate origins. The Cardigan is one of the oldest breeds of dog in Britain and has been employed for centuries by Welsh farmers to herd cattle, herding the owner's livestock to grazing areas and driving the neighbor's cattle out of gardens and open pastures. In early settlements, though, these dogs were prized family members, helping hunt game and guarding children. Cardigans are the larger of the two breeds, with large rounded ears and a foxy, flowing tail of moderate length set in line with the body. Though it is allowed more colors than the Pembroke, white should not predominate the coat. The Cardigan is a double-coated dog. The outer coat is dense, slightly harsh in texture, and of medium length. The dog's undercoat is short, soft, and thick. The breed stands about 12" at the shoulder and weighs in at approximately 30 lbs. The Cardigan is sturdy, tough, mobile, alert, active, intelligent, steady, and neither shy nor aggressive. The Pembroke is believed to have been introduced to Wales by Flemish weavers about 1100, though 920 is also a suggested date. Another possibility for this Corgi's origin is breeding between Cardigans and the Swedish Vallhund, a spitz-type dog closely resembling the Pembroke and brought to Wales by Norse invaders. The breed features pointed ears and is somewhat smaller in stature than the Cardigan. Considered a practical little dog, they are low-set, strong and sturdy with sufficient stamina to work a day on the farm, but friendly and out-going as well. The dog's head is fox-like and the tail short, which can be accomplished through breeding or docking. Historically, the Pembroke was a breed with a natural bob tail (a very short tail), and today, if the Pembroke has a tail at all, it is usually curly. Due to the advent of tail docking in dogs, the bob tail was not aggressively pursued, with breeders focusing instead on other characteristics, and the tail artificially shortened if need be. Given that some countries now ban docking, breeders are again attempting to select dogs with the genes for natural bob tails. Pembrokes stand 10 to 12 inches and weigh approximately 28 lbs. The first recorded date for Corgis appearing in the show ring in Wales is 1925. The first show Corgis were straight off the farm and gained only moderate attention. Subsequent breeding efforts to improve upon the do's natural good looks were rewarded with increased popularity. For years the two breeds, the Cardigan Welsh Corgi and the Pembroke Welsh Corgi, were shown as two varieties of a single breed. Since the two Corgi breeds developed in the Welsh hill country, in areas only a few miles apart, there is evidence of crossbreeding between the two that accounts for the similarities. Corgis can compete in dog agility trials, obedience, showmanship, flyball, tracking, and herding events. Herding instincts and trainability can be measured at noncompetitive herding tests. Cardigan and Pembroke Corgis exhibiting basic herding instincts can be trained to compete in herding trials. Corgis have been made popular by Queen Elizabeth II who keeps at least four in her retinue at all times. Her first Corgi was called Susan. She currently keeps five Corgis and four Dorgis (Corgi/Dachshund cross). Some portraits of Queen Elizabeth II include a Corgi. Corgis as characters were incorporated into the storybook fantasies Corgiville Fair, The Great Corgiville Kidnapping, and Corgiville Christmas of American author and illustrator Tasha Tudor. In 1961, the Walt Disney film, Little Dog Lost, brought the Pembroke Corgi widespread publicity. In the anime Cowboy Bebop, the main characters have a super-intelligent Pembroke Welsh Corgi, Ein, on their ship. The Top Shelf graphic novel Korgi plays on the folklore tradition of the corgi as a faerie draft animal. It features the "Mollies" (fairy-like beings) who live in close relationship with the land and their Korgi friends, who are based on and resemble the Pembroke Welsh Corgi.